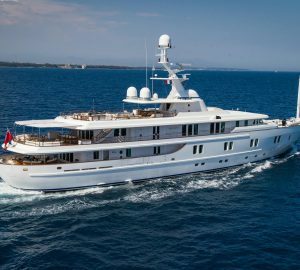 Built by CRN Ancona in 2000 and refitted in 2017, 63m/201ft motor yacht KATHARINE (ex. 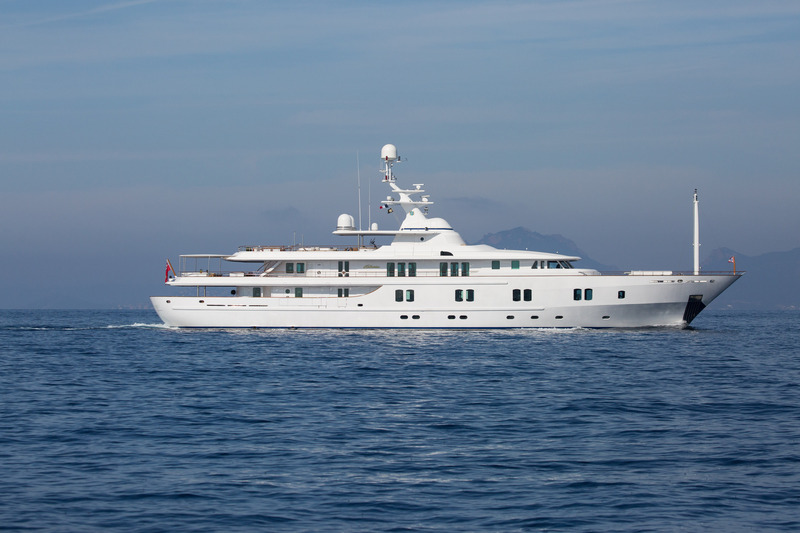 NEW SUNRISE) has the naval architecture and exterior design of Studio Scanu, and her interiors are the work of Zuretti. The accommodation sleeps up to 12 guests over 6 cabins. 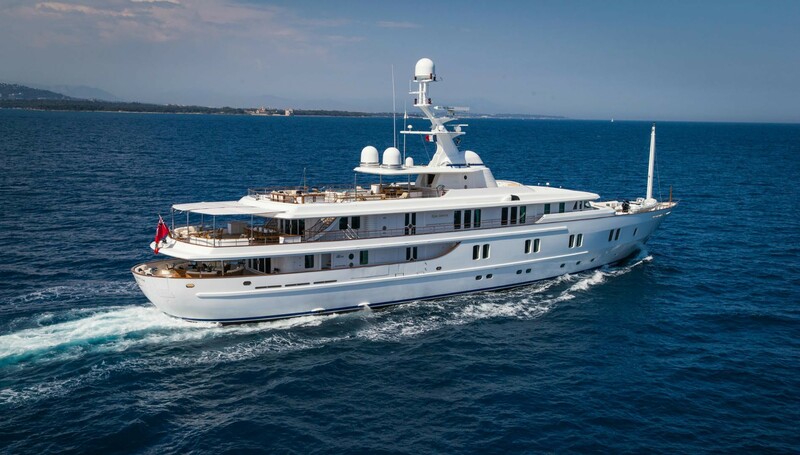 The main deck aft has a circular lounge for sheltered outdoor living and socialisation is a large group. Below, the hull opens up to create a beach club where guests can relax outdoors close to the water. The upper deck foredeck stores two tenders to leave the lower aft deck free for the beach club. A grand alfresco dining table on the upper deck aft will seat all 12 guests in the shade and after the meal there are two separate seating areas with a canvas covering the salon. The lavish sundeck is designed for use throughout the day: An alfresco breakfast table is situated under the hardtop shade and behind there is a massive Jacuzzi surrounded by sunpads. Sun loungers are laid out at the sides and to the aft the sun-exposed lounge is comprised of three sofas and a coffee table where guests can relax and admire the spectacular scenery. The lower deck aft s fitted with a beach club and a forward tender garage. The engine room is aft of the middle lower deck and the forward lower deck through to the bow is dedicated to the crew accommodation. The main deck hosts the guest accommodation and the bow holds the full-beam Master suite with lounge, an en-suite bathroom, walk-in wardrobe and an office. The VIP stateroom, three double cabins and one twin cabin are located in front of the foyer. The large and lavish lounge is timelessly styled using dark wooden panelling that complements the furnishings in cream. The forward bar has a choice selection of drinks to enhance an evening of conversation, and a grand piano and a fireplace add to the interior ambiance. The upper deck layout has a beautiful large forward skylounge to offer an alternative to the main salon. There is a comfortable forward seating area in front of a widescreen TV and also has a grand piano placed in the centre of the room. Additional seating areas are placed beside the windows and the aft fireplace. Behind the foyer there is a separate formal dining area for celebrating special occasions in opulent surroundings. Classic furnishings and fixtures add to the ambiance with dark wooden panelling contrasting against cream fabrics and crystal goblets. 2 X 2000 HOP CAT 3516B engines provide a top speed of 15 knots, a cruising speed of 13.5 knots. Master double with study, day head and shower. King size bed and his and hers bathrooms. Hers offers Jacuzzi tub with shower, bidet and toilet and his to port with shower, bidet and toilet. Forward again are large his and her wardrobes. VIP just aft of the Master, to port, offering a large walk-in wardrobe, queen size bed, bath with tub and shower, bidet and toilet. Three double staterooms and one twin stateroom each with shower, bidet and toilet. All cabins have a desk with mirror and seating. Bathroom products are Bulgari. Tenders & Toys: 1 x 14m Intrepid with 4 x 350hp outboards 1 x 5.78m AB Rib with 115HP 1 x Seadoo RTX jetski 1 x Seadoo GTX jetski 2 x sea kayaks 3 x stand-up paddle boards (2 x foam, 1 x solid) 2 x wakeboards 1 x knee board 1 x pair water skis 1 x pair junior waterskis 1 x banana - 4 person 1 x chariot - 2 person Fishing rods, snorkelling equipment 3 x electric bikes Gym equipment includes: 1 x elliptical machine 1 x stationery bike Hand weights Yoga mats Gym ball Gym bricks Audio Visual Equipment and Deck Facilities: 50" Plasma TV with Sky Sat TV, Blue Ray disk and Kaleidescape (in Upper Salon, Lower Salon) 50" Plasma TV with Sky Sat TV, Blue Ray disk and Kaleidescape (in Master study, Master Cabin) 26" LCD TV, Blue Ray disk, Sky Sat TV and Kaleidescape (in all guest cabins) Yamaha piano 350 Blue Ray movies loaded on a Kaleidescape server Seatel satellite TV system Kaleidescape hard drive Movies and Music in all social and Guest areas on the interior and exterior, controlled through an iPad/iPod based touch screen throughout the yacht.